In his article ‘Essential Pears and Apples’, on the main web-site, Adrian Baggaley rates Katy above Discovery as an early apple, but I think that this is under-rating Discovery, which in my experience is a splendid variety. Its fruits are a pretty pinky red and when really ripe the flesh becomes marbled with pink, which must indicate plenty of antioxidants if we follow the logic explained in ‘Red and Bitter’ on the phenol content of apples that Howard Stringer has translated – see main web-site. Discovery is crisp, sweet and juicy with some of the strawberry flavour of Worcester Pearmain, one of its probable parents, but it must be well ripened to catch it at its best. In addition there is its natural resistance to mildew and scab and unlike most earlies it does not drop off but hangs on to colour and ripen up beautifully. This was one of the features that recommended it to the late Jack Matthews, the nurseryman who introduced Discovery in the early 1960s. To popularise his new variety he used to hold a party under the original tree, which is probably still growing at Langham in Essex. Let’s extend the ‘must haves’ to Discovery? Horsiculture – a threat to old orchards? I note Howard Stringer’s reference to ‘horsiculture’ replacing orchards in Surrey. This has been a feature of the East Anglian landscape too. Some orchard surveys were carried out in 2005/6 of several hundred orchard sites in Norfolk and Cambridgeshire that were mapped on the Millennium Edition OS Explorer maps. 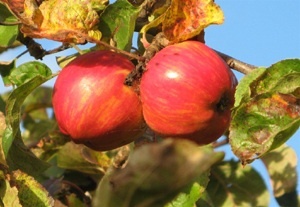 Both counties have shown conversion to pony paddocks as a significant threat to old orchards in recent years. It is too easy to put a fence round the site and just put the ponies in. You don’t even need to remove the trees – the ponies strip the bark in a matter of weeks. Are there any other counties where this is the common fate of old orchards? The Flower of the Town apple variety illustrated in my original piece clearly differs from that held in the National Collection at Brogdale and has given rise to some comment. If nothing else, it confirms the difficulty of authenticating varieties when only the name of the collector, in this case, Miss Holliday of Leeds, working on behalf of P. Morton Shand in 1947, is known but not the collection source and where the original description, in this case Hogg in the 1859 edition of British Pomology, The Apple, is not particularly helpful – ‘of a roundish shape, striped with red, and in use from Sept. – Nov’. Hogg implies that this was a variety from Backhouse Nurserymen of York. ‘Flower o’ th’ Town’ as it is listed, appears in my 1827 Backhouse catalogue, was presumably still there when Hogg published his description in 1859, but does not appear in my 1910 catalogue. By that time a good deal of what these days we would probably call ‘rationalisation’ of varieties had taken place. Hogg described the variety as ‘of indifferent quality’ and by 1910, Backhouse was having a deliberate purge of such varieties; ‘… many kinds that that have no distinctive merit have therefore been rejected.’ This means that, by 1947, when Miss Holliday collected her specimens, though Backhouse still existed and would do so for another twenty years, it would be likely that there was no original source material available from the nursery itself. In the case of the Flower of the Town described by me, it came from Sutton Farm in East Yorkshire where, since the mid to late 1800s, it has been known to four generations of the Beal family as Flowery Town, one of the synonyms (the other was Redstreak’) under which it was listed in the Backhouse of York nurseryman’s catalogue of 1827. Just to muddy the waters further however, the synonym Redstreak was also used in the Backhouse catalogue for the variety Rawson and there was too an Early Redstreak. It would be quite possible therefore for an assumption to be made that an apple collected as Redstreak was Flower of The Town when in fact it was something else. In case of doubt, multiple, unrelated, occurrences of the same apple, known by the same name, may help to indicate authenticity. It is helpful therefore that Nick Burrows tells us of the occurrence of this variety elsewhere in the north and I can confirm that the Flower of the Town in the 2007 Northern Fruit Group display was not supplied by me. On the same theme, however, soon after writing to Fruit Forum, I encountered another tree of what was clearly the same variety, close to my home in west York, an area once noted for its orchards. The owner told me that his tree, for which he did not have a name, had been inadvertently propagated in the mid 1950s when a piece taken from the original, much older and now lost tree, was stuck in the ground as a marker and rooted. The new tree is of only moderate vigour on its own roots, having grown to only about 10-12 ft in fifty years. What is particularly interesting however is that this tree and its parent grew/grow only a mile or so from the old Backhouse Nurseries, the proximity of which has observably influenced the varieties planted in local orchards. If the National Collection accession of the same name came from but a single source, it would contribute to circumstantial evidence that the Sutton Farm specimen, now also thought to exist under the name Flower of the Town in several other, unlinked locations, may be the original ‘Flower of the Town’ listed by Backhouse. Certainly both contenders now merit further study. 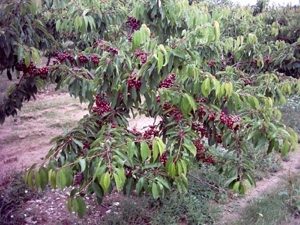 Comparison of Flower of the Town fruits from Beckfield Lane, West York and Sutton Farm, East Yorkshire. 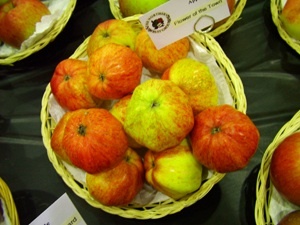 Note colour variation from yellow, streaked red to almost complete red. The fruits are ribbed and somewhat conical but several could fit Hogg’s description of ‘roundish’. Flower of the Town from Beckfield Lane, West York, Propagated in 1950s from an old tree growing about a mile from the Backhouse Nurseries.